Samaritan is concerned with saving as many people as time will allow. “Astro City: Life in the Big City” embraces the fantastic, the ridiculous and the aspirational, while instilling a real world sensibility, in this wondrous six-chapter volume of interrelated stories about a superhero-protected metropolis known as Astro City. Writer Kurt Busiek brings everything he understands about comic book conventions, the secret identities, the supporting characters, the maniacal villains, and uses them in differing ways, whether they are driving the plot or exist only to add dimension to the story. Busiek and artist Brent Anderson introduce us to the familiar, for longtime comic enthusiasts at least, people and corners of Astro City in what turns out to be an anthology of tales featuring a cast of superpowered and non-powered folks. “Life in the Big City” opens with a story featuring Astro City’s protector, Samaritan, in the story “In Dreams”. 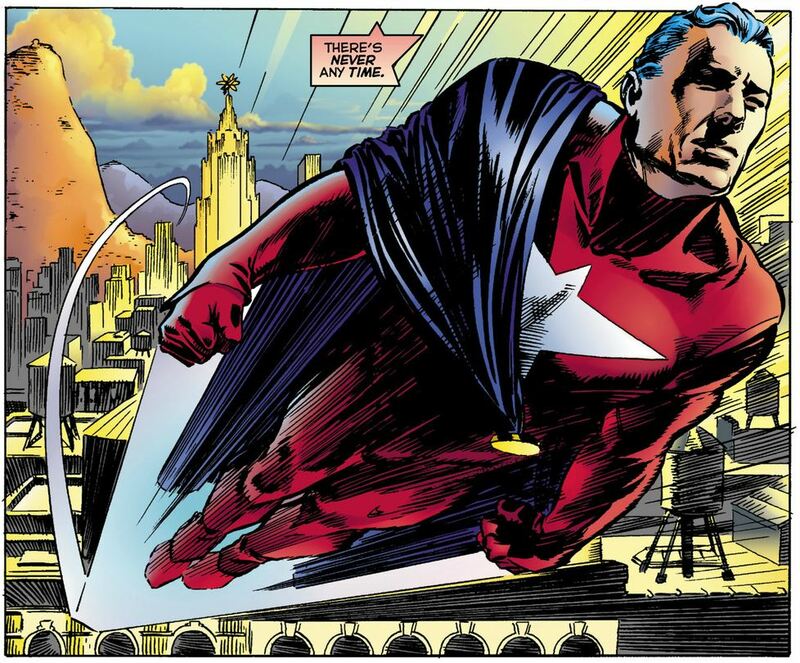 Busiek immediately takes us inside the hero’s yearnings, to be able to soar peacefully through the sky without being hampered by the need to rush to the aid of those in danger. Busiek and Anderson illustrate how the hero would logically manage his time as he works to rescue as many people as possible. Samaritan constantly analyzes how long he spends at each incident, it’s always a matter of seconds, and scrutinizes himself for slowing down long enough to assure a child that her cat is safe. Anderson and Alex Ross have designed a world of characters who could well have existed in DC’s Golden and Silver Ages. Anderson gives the characters and city residents a contemporary feel, while offering nostalgic nods to bygone eras, such as in the form of a giant robot or a super team headquarters with a meeting table in the shape of the team’s initials. 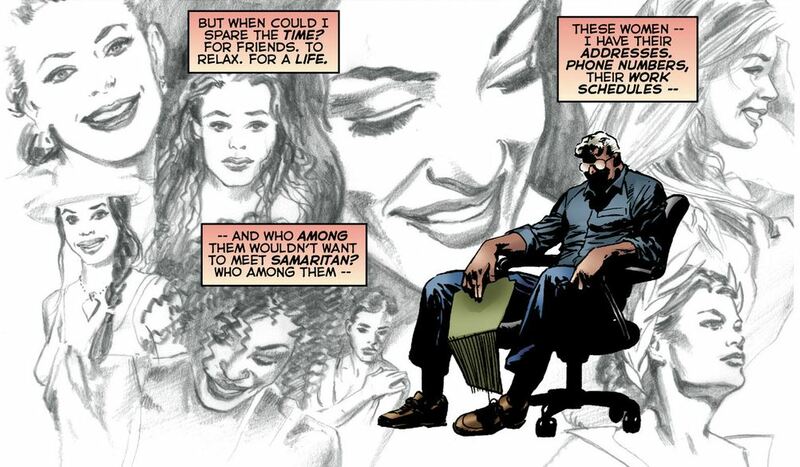 Busiek presents a fascinating day in the life of Samaritan in which the writer shows us, point by point, how a character such as Samaritan would realistically manage his dual identities and protect a world. In “The Scoop”, we see the fantastic world of Astro City through the eyes of Elliot Mills, editor of the city’s newspaper, the Astro City Rocket. The story is told in a flashback as Elliot recounts one of his earliest stories when he was just a budding reporter. “The Scoop” is as much a tale of journalistic integrity as anything else and establishes the honest virtues of Mills. Anderson shines in this chapter, his city is lined with buildings, department stores and crowds of people who seem pulled from a real life metropolitan. Colorist Steve Buccellato presents Astro City as bright, summery and hopeful in the glorious opening pages of the story. Busiek presents situations and characters that ought to be relatable to readers of “Life in the Big City”; for example, Samaritan attempts to manage his time and Elliot Mills takes great pride in his work. However, in the best chapter of the volume, the writer introduces Eisenstein, a sad sack two-bit criminal whose fears often gets the best of him in the story “A Little Knowledge”. Eisenstein sees the hero Jack-in-the-Box unmask himself and soon uncovers the man’s true identity. At first the loser imagines the riches in store for him when he uses this newfound information for monetary gain. Eisenstein’s dreams turn to nightmares as he envisions one awful scenario after the next, each one growing more unpleasant. Who doesn’t imagine worst-case scenarios when faced with an important meeting at work or a significant conversation with a loved one? You know, where you conceive that everything is going to go wrong. Really, really wrong. Busiek, Anderson and Buccellato brilliantly capture Eisenstein’s sinking feeling that nothing is going to work out for him in brief sequences that go from comical to irrationally violent. Samaritan ponders how he can open himself up to a relationship in this beautifully illustrated panel by Anderson. The story “Safeguards” centers on Marta, a young woman from Shadow Hill, a mysterious borough of Astro City, that is populated by immigrants who have grown accustomed to the area’s vampires, ghouls, demons and other creatures of the night. It’s a brilliant story about cultural barriers; Marta finds her home just as normal as the one where flying men and women swoop in to protect its citizens. Again, Anderson shows off his chops as he creates the vastly different and spooky European-looking town of Shadow Hill. Crotchety old Mr. Bridwell is not who he seems in “Reconnaisance”, a story that follows a covert alien as he gathers information on the superpowered beings who protect Earth. Should the planet be invaded or does he see something in the human race that reminds him of his own? Bridwell focuses on the fractured hero Crackerjack to make his verdict, but when he does, we see that the alien is just as petty and arbitrary as the humans who he’s been tasked to observe. Anderson focuses on Bridwell’s hypercritical eyes throughout the story, illustrating that the character is absorbing every necessary detail before arriving at his decision. Busiek and Anderson bring the first volume of “Life in the Big City” to a close with “Dinner at Eight”, in which Samaritan and Winged Victory go on a date, first in costume and then incognito. The writer excels at dialogue and developing character and this final chapter allows him to do both as the two most famous heroes on Earth learn that they don’t share similar superheroic ideologies. Anderson’s sense of action and his precise character work are an excellent match for Busiek’s layered story. The artist seems capable of capturing just about any reaction that Busiek’s script requires, be it the hopeful look on Marta’s mother’s expression when faced with the possibility that her daughter might meet a local boy or the utter paranoia of Eisenstein as he contemplates numerous violent outcomes. Busiek, Ross and Anderson have constructed a living, breathing world by exploring it from the six distinctly different vantage points. Astro City is a big, bold place that is more optimistic than it is frightening. The creators have taken the familiar and breathed real life into all of its characters, from the wholesome to the malevolent. None of the material from which “Life in the Big City” is inspired is treated with tongue-in-cheek. It’s treated with affection.